Justin was the 26th recipient of a dream hunt through Hunt of a Lifetime. The pictures are as follows: top picture is Tina Pattison, founder of Hunt of a Lifetime with Justin, bottom picture is Justin with his deer. Justin is living out his dream hunt for whitetail in Pennsylvania with a rifle, and a little snow is not about to stop this determined young hunter. Duane Stauffer, Justin's guide, has also made up his mind that this will be a hunt that will not be forgotten. Dream hunts like this are made possible by an organization called Hunt of a Lifetime. 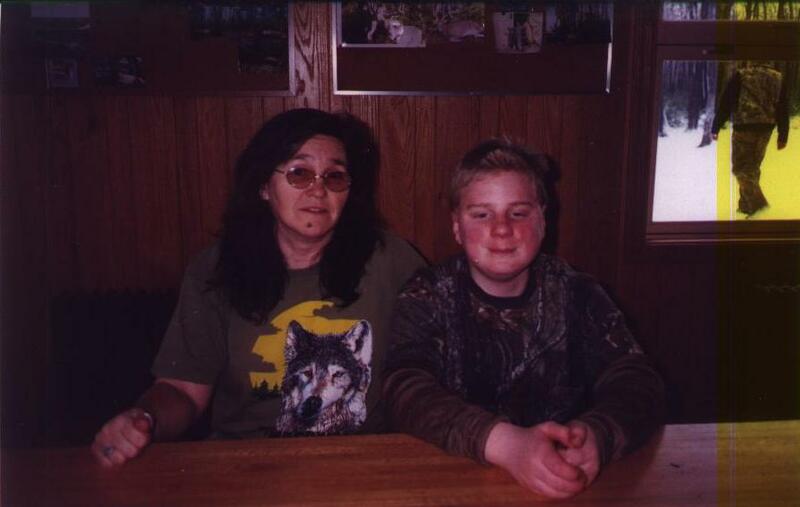 Tina Pattison started the foundation in August of 1999 in memory of her son, Matthew. Matthew died of Hodgkin's disease at the age of 19, but not before going on his hunt of a lifetime. Matt had a dream, a moose hunt with his father. Tina tried going through a nationally known wish granting foundation to arrange Matt's hunt only to discover the organization has a policy regarding hunting that states, "Chapters shall not grant wishes that involve the use of or gift of firearms or other weapons designed to cause injury." Through tireless efforts of his mother and the good will of many other people, Matt got to go on his dream hunt. Tina Pattison realized that if her son's dream was a hunting adventure, there must be other seriously and terminally ill kids with similar dreams. There are few things more powerful than a mother's love, and it is that power that made Hunt of a Lifetime a reality. Like Matt Pattison, Justin also battles Hodgkin's disease. Despite many hospital visits and chemotherapy treatments, Justin has a decidedly positive outlook on life and enjoys the same activities as other kids his age. Since Justin lives in Ohio, he has never had the opportunity to hunt with a rifle. Thanks to Hunt of a Lifetime, Paradise Outfitters and Bushnell's Secrets of the Hunt, Justin's dream has come true. The day of Justin's hunt with Paradise Outfitters was near blizzard conditions, but this was not discouraging to him. Lake effect snow-storms in Pennsylvania are bad on the ground, now imagine being in a stand 16 feet in the air. The snow is blowing so hard that visibility is only about 25 yards. Ready to go inside and warm up yet, not Justin. Covered head to toe in a sheet of snow, Justin and Duane wait in the stand in the hopes that a big buck will be out. It is said that patience is a virtue, that being the case, these two guys are more virtuous than most clergy. Patience apparently does pay off. The snow lets up slightly and a beautiful 8-point buck appears to be coming into range. Justin gets into position with his Thompson Center .243 topped with the Bushnell Elite 3200 scope and is ready to take his first buck. He squeezes the trigger. The silence is broken. The target hit. Justin Sizemore has just shot his first whitetail buck. Another dream fulfilled and another young sportsman with a new appreciation for the outdoors. For more information or to make donations to Hunt of a Lifetime log onto www.huntofalifetime.org or call 866-345-4455.